Sugarland’s Jennifer Nettles will host the two-hour holiday extravaganza CMA Country Christmas, airing Thurs., Dec. 1 (9:00-11:00 PM/ET) on ABC. 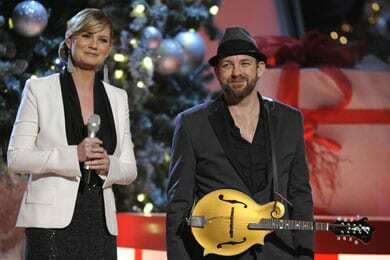 Sugarland will perform “Silent Night” plus there will be performances from American Idol runner up Lauren Alaina, Amy Grant, Faith Hill, Little Big Town, Martina McBride, Idol winner Scotty McCreery, Kellie Pickler, Rascal Flatts, Darius Rucker, Brian Setzer with special guest Brad Paisley, Keith Urban, and Vince Gill in a special duet with Miss Piggy. CMA Country Christmas is a production of the Country Music Association. Robert Deaton is the executive producer, Paul Miller is the director, and David Wild is the writer. The special was shot in high definition and will be broadcast in 720 Progressive (720P), ABC’s selected HDTV format, with 5.1 channel surround sound.